Orli Moscowitz is the 2017 Odyssey Award-winning producer of ANNA AND THE SWALLOW MAN by Gavriel Savit, narrated by Allan Corduner. 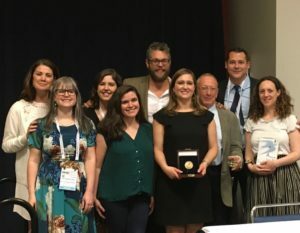 Her speech was delivered at the American Library Association Conference in Chicago, Illinois on June 26, 2017. 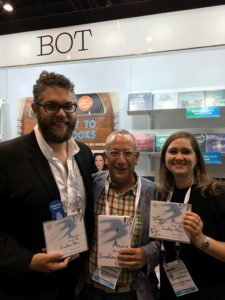 Click here to listen to an interview with narrator Allan Corduner about ANNA AND THE SWALLOW MAN and the art of audiobook narration. Anna’s story begins at the end of her childhood innocence. It’s the morning of November 6th, 1939, and up until then Anna has lived an idyllic life in Krakow with her father, a linguistics professor. Anna’s days are shaped by language, and by the age of seven, when this story begins, Anna is fluent in many. But on that morning in 1939, Anna’s father is swallowed by the Nazi behemoth, and Anna is thrust on her own into an unravelling and unfriendly world. She soon meets a mysterious man with the incredible ability to communicate with birds and to transform himself through language and demeanor to best survive in the shifting landscape of war-torn Europe. He keeps his true identity carefully masked, and we know him primarily as The Swallow Man. He takes Anna under his wing, as it were, and teaches her a new language—Road, in which the express purpose of every word is survival. Gavriel Savit’s writing is intensely poetic. Every phrase finely honed. Moments of profound cruelty and loss are carefully balanced with wry humor and generosity. Who could possibly voice this literary tour de force? When I read a book it speaks to me. I clearly hear a voice in my head telling me the story. Not a groundbreaking revelation, I realize. But one of the most important aspects of my job as an audiobook producer is casting—which simply means finding an actor whose voice embodies that voice in my head. And, most importantly, matches the voice in the author’s head. Allow me to give you a very brief glimpse into my psyche. I think I have a pretty good sense of humor. I enjoy a good laugh. But at my core, I’m a fairly serious person. A vivid childhood memory: Me, five years old, sitting in the back seat of my family’s blue station wagon, being driven to school by my parents, Honey and Gary Moscowitz, and my dad saying, “Orli, don’t take things so seriously!” And my mum nodding in agreement. That message never penetrated. Which works out really well for my work as an audiobook producer, because part of my job is basically being a professional nit-picker—keeping productions on schedule, making sure my team is doing what they’re supposed to be doing, when they’re supposed to be doing it. But finding the right voice is paramount. So, while casting is one of the most creative and fun parts of my job, being who I am, it’s also the most stressful. It’s the part that most often wakes me at 4am in a cold sweat. But little of that stress materialized when I was casting Anna and the Swallow Man. Actually, Anna and the Swallow Man may have been one of my easiest casting jobs ever. Straight off, I heard Allan Corduner’s deep, rich, melodious, voice. You see, Allan holds a special place in my heart. Not only because is he warm, charming, funny, and just generally wonderful, but in 2006, ten years before casting Anna and the Swallow Man, I cast Allan to narrate one of my favorite audio productions, The Book Thief. So I knew that Allan’s ability to subtly create a vast array of characters, his sharp, impish wit, and his ability to pay homage to each shift in language, made him the right fit for this story. The next step was to convince Gavriel that Allan was the perfect narrator. But that’s also a non-story. I gathered an array of voice samples, sent them to Gavriel along with a gushing explanation of my profound love for all things Allan, and crossed my fingers. And Gavriel immediately agreed. I still have the email chain. I sent Gavriel an email at 5:11pm, and I received his enthusiastic reply at 8:57 the following morning. No need to convince or cajole. As a producer, I aim to curate the best team around each production. So once I’ve cast, the next step is to hire a director whose particular expertise and interests connect strongly with the text and allow them to guide the actor’s performance. Garrick Hagon and I have collaborated for years and years. He directed my full-cast productions of Philip Pullman’s His Dark Materials trilogy. Fun fact: Garrick is an actor as well as a director, and he played Luke’s best friend, Biggs Darklighter, in Star Wars: A New Hope. Go ahead. Google him. Check him out on YouTube. By the way, he no longer has that bushy mustache. But I digress. As a fellow actor, Garrick is particularly attuned to actors’ strengths, and he knows the technical and creative language of performance so he can skillfully and efficiently suggest ways in which narrators can tweak their performance to best honor the author’s intentions. Garrick, a thousand thank-yous. Allan, I can’t thank you enough for your inspired work on this production. Recording audiobooks is grueling! Sitting in a coffin-like, sound-proof booth for 8 hours a day might be nightmare-inducing for some, but there’s never any whiff of you taking performance shortcuts. For you, each word is a gem presented with meaning and mastery. perfectly crafted. I wanted to memorize and revisit them at will. Many thanks to YALSA chair, Lynn Carpenter, and the entire Odyssey Committee for this incredible honor, as well as their many hours of listening and deliberating, and to Booklist for sponsoring the Award. The Audies and Grammys are thrilling—it’s always wonderful to have one’s hard work recognized. 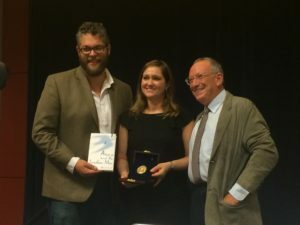 But there’s something deeply gratifying about receiving the Odyssey Award because it’s bestowed by you—librarians and educators, the highest arbiters of quality in the publishing industry. You can’t be swayed by celebrity narrators, fancy packaging, or slick marketing. 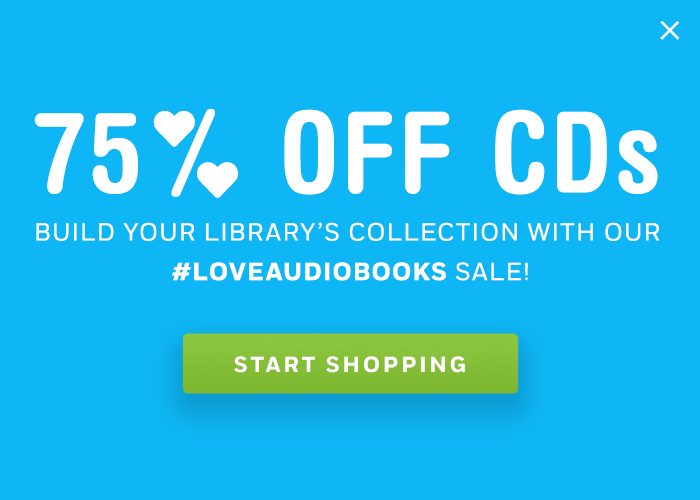 You listen to audiobooks and you judge them according to stringent criteria with the best interest of the listening community in mind. Period. You’re the angel on my shoulder, a constant reminder that every production is a chance to get more listeners hooked on audiobooks. That if a listener’s first experience with the format isn’t a great one, we’ve lost an opportunity. It’s an honor and a privilege to produce for Penguin Random House Audio/Listening Library, where Dan Zitt and Karen Dziekonski foster an environment of creative freedom and unfailing support. A big shout out to Rebecca Waugh and Emily Parliman who build our amazing Listening Library lists. Thanks to Ok Hee Kolwitz and Mike Murray who oversee our post-production department, Tim Bader for his wonderful edit, and Rick Bradley and his team for their exacting QC work. I dedicate this award to my parents. Two of my biggest fans. When I won my Grammy for Harry Potter and the Goblet of Fire, my parents published a letter in my hometown newspaper, The Montreal Gazette, pointing out that Joni Mitchell wasn’t the only Canadian to win a Grammy that year. Likelihood that The Montreal Gazette will be hearing from Honey and Gary Moscowitz very soon: extremely high. 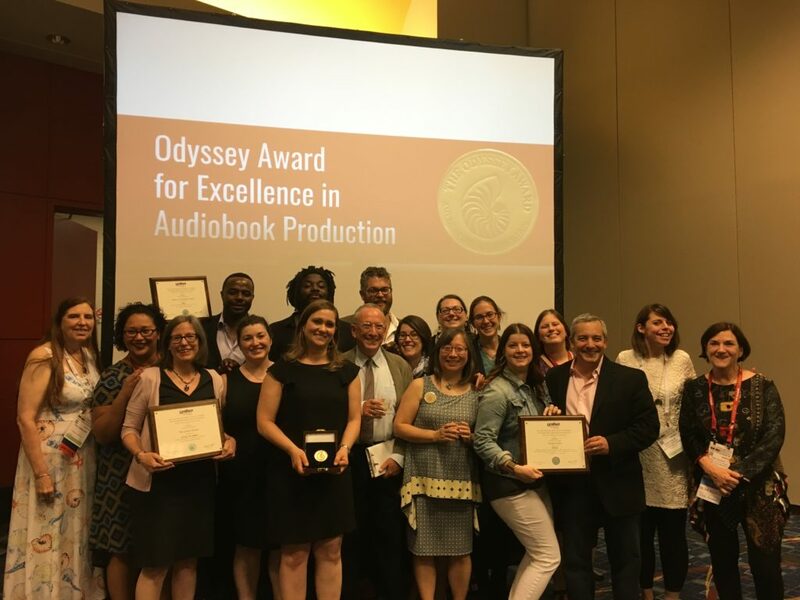 Odyssey Award and Honor-winning producers, narrators, and authors! Sign up for our BOT & Listening Library newsletters to get more behind-the mic scoops from our authors, narrators, and producers!